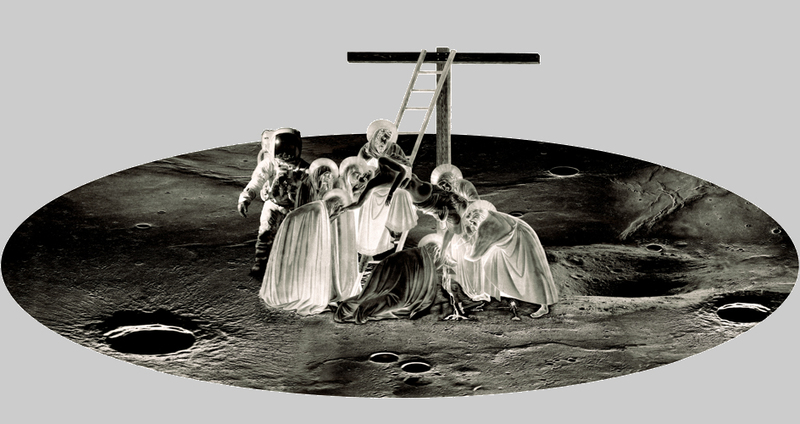 The descent from the cross as set on the moon. Such juxtapositions are Christopher Clack’s stock-in-trade. Tyrannasaurus rex and crucifix, cemetery and prism, head formed by the moon, pieta with astronaut - these are just some of the disparate images brought together in his work. In this work science and religion are juxtaposed, but are they opposed or reconciled within the image? In the oppositional relationship between science and religion, science is commonly portrayed as the future and religion as the past. What is future and what is past in this image? The image itself isn’t telling; the two events are simply set alongside each other. Yuri Gagarin famously flew into space, but, in the words of Nikita Khrushchev, “he didn't see any god there." Buzz Aldrin, by contrast, consumed the Holy Sacrament while on the surface of the moon. Who was right and who was wrong? Was Christ to be found on the moon and in what form? Similar questions were posed by C. S. Lewis in his sci-fi trilogy where the Fall was re-imagined and re-enacted on another planet. Yet Clack’s image is not simply a concept raising philosophical and theological questions. It is primarily an extraordinarily beautiful image. Although a digital print, the work has the look and feel of a line engraving, one which is delicately balanced in terms both of its use of light and shade as well as its construction around the axis of the cross and ladder. These both extend outside the enclosed oval of the image suggesting that there is more beyond the constraints of the image. At the centre of this balanced beauty is the dark gash of Christ’s dead body. ‘God is dead’ is a phrase that Clack has conjured in a recent series as billboard advertising on the streets of Peckham. In Descent II God is literally dead and man, as astronaut, has come of age. In this image we see the greatest human achievement to date - to leave the earth for the heavens and return alive - juxtaposed with the incarnation - God’s decision to leave heaven to live and die on earth. Which represents the true achievement? Which is the more significant action for humanity? The questions mount up as we contemplate the complexities that Clack has created simply by juxtaposing these two images. This multiplication of questions through the juxtaposition of images suggests that The Descent from the Cross, as concept and image, survives the test set by Clack within the vacuum of the moon. The image is alive multivalently with meaning which is released and revealed simply by Clack’s imaginative setting of the image in this alien landscape. As Clack himself has said, “The 'Religious' is found in the least expected places.” What would be the impact, I wonder, were we more frequently to take religious images out of their religious context, as Clack has done, and trust them to raise their questions and reveal their meanings in other landscapes, cultures and worlds? Christopher Clack: Descent II, 90cm x 100cm, digital print, 2003. Christopher Clack trained as a painter at the Camberwell School of Art and Royal College of Art yet now works in a completely digital format. The connection between religion and art is for him a profound one, having implications for the way we think about religion and art. His work can be viewed at www.christopherclack.co.uk and www.modernreligiousart.com.